Persian rugs are hand woven rugs that are made in Iran. On March 21, 1935 Persia changed its name to Iran. Even today the names Iran and Persia are somewhat interchangeable. To be correct, we should really call them Iranian rugs. Persian rugs are usually bought for the home and can often be found in commercial locations. Upmarket stores, hotel lobbies, reception areas and board rooms often feature oriental rugs. 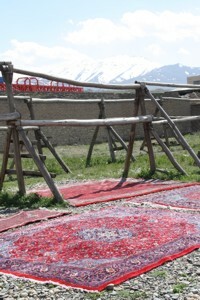 Today hand woven rugs are an important commercial product of Iran. After oil, rugs are one of Iran's biggest export products. Persian rugs for your home. Choosing to have a Persian rug in your home is a way of adding to your quality of life. A hand woven rug from Iran adds status to a home as well as comfort and style. It will make you more successful in business and your children will love you more. Ok just joking about the last bit. Investing in a beautiful Persian carpet is an extravagance that not everyone will be able to afford. But It's a long term purchase which if taken care of will last a life time. And maybe even two. How to measure up for a rug. When shopping for a rug you will need sizes. Length and width. Also check to see if there is clearance where doors open. Take something from your room with you when you shop. Fabric samples and carpet or wood colours are useful. You could take a photo of your room along so that we can help you find your perfect rug. Rugs don't come in standard sizes. Usie a metal tape measure to take the maximum length you can fit in and then also the minumum length you can get away with. Now take the maximum and minimum sizes of the width. 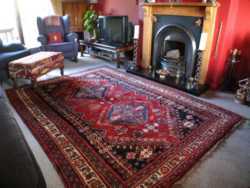 Old Persian rugs are very popular as collector’s items. It's still quite possible to come across lovely old rugs at clearance sales. With a good clean and a few repairs they can be given a new lease of life. At the other end of the scale the trade of rare antique rugs is beyond the reach of the more modest investor. Persian rug designs can be either geometric or curvilinear. Floral designs are quite common. There are iconic designs such as the Persian tree of life or the Vase design. Occasionally Persian rugs are pictorial. They feature animals and people in rugs such as the Tabriz hunting scene carpets. As a rule the design is governed by the number of knot per inch. Rugs with fewer knots tend to have more simplistic stylised patterns. Kilim rugs have no pile. The design is formed by wrapping individual warp threads in yarn. This way the yarn itself forms the weft of the rug. Pile rugs are made by knotting yarn to two of the warp threads When a complete row is tied across the wide of the rug the knots are locked in place by a weft thread. A Persian rug is woven on a loom. A weaving loom can be a simple wooden frame pegged out on the ground or it can be a complex steel structure housed in a purpose build workshop. Looms built to make very large Persian rugs need to be immensely strong. Before carpet weaving can start a foundation of wrap threads must be set up on the loom. Warp threads can be made from animal hair, cotton or silk. Once a loom is set with its warp threads the weaver can start to work on producing the design. 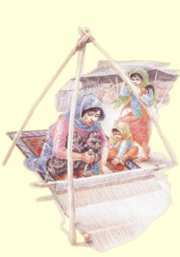 The weaver of a Persian rug will work with wool or silk. Not surprisingly the more finely Persian carpets are woven the longer they take to make. Consequently the finer rugs are much more costly.